It’s been quite a while since my last article here but it’s that time again. Time for some more Do-It-Yourself (D.I.Y.) work articles. First off today we’ll look into some, scarce, history on the Nylon Saddles that we’ll be making. The reason I say “scarce” for the history is that when I started looking into the Gibson Nylon saddles there really isn’t much to be found. So I’ll try to give a rundown of what I’ve discovered. 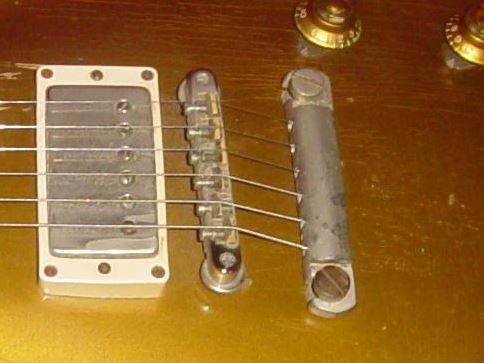 In the beginning of the Les Paul, and other hard bodies, they did not have the luxury of the Tune-o-matic bridge. 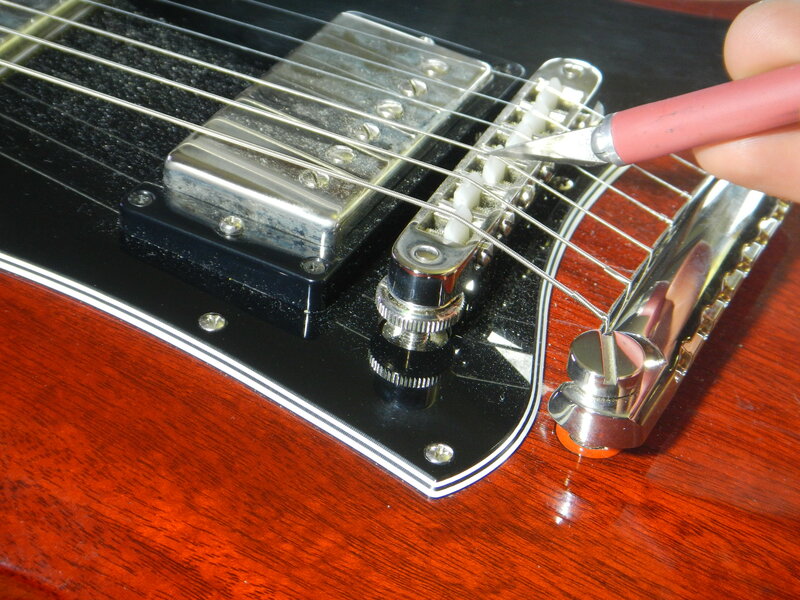 They had a wrap around stop bar that was set in the body at an angle to achieve an unreliable degree of intonation. While some people were able to come up with some creative ideas for the high action these tails created, there just needed to be something else. Debuting on the 1964 Les Paul Custom came the ABR-1 Tune-o-Matic Bridge. 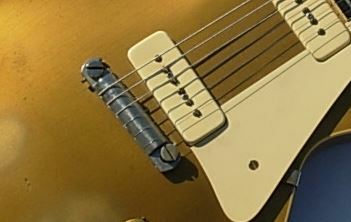 This little piece of innovation changed the way that Gibson, and now many other brand, guitars functioned. 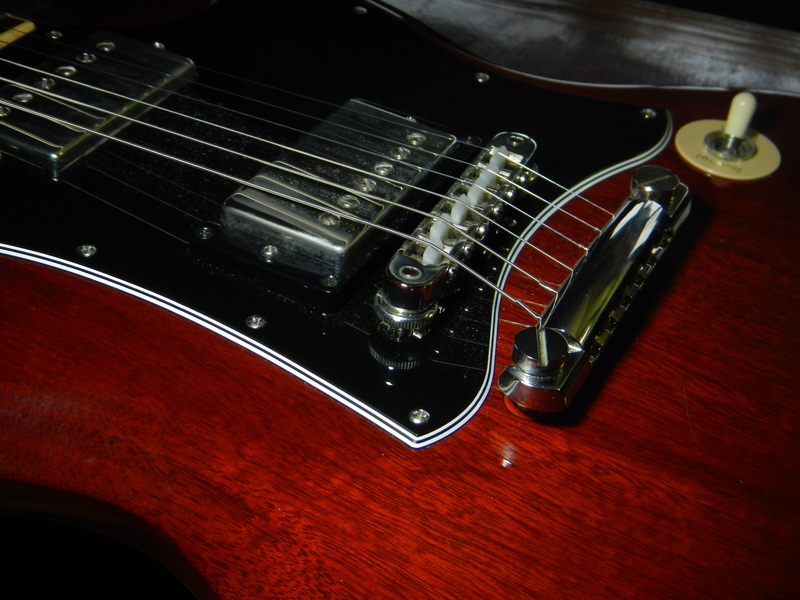 The Tune-O-Matic allowed for a micro adjustment of the intonation and action height achieving a higher quality of performance. So into the Nylon mystery. While there are varying, and no official, accounts to be found about these saddles I have boiled my research down to a single reason Gibson used them. Rattle dampening. Yep, that’s right, rattle dampening. While the ABR-1 bridge was a vast improvement over the wrap around bridge it also came with it’s drawbacks. 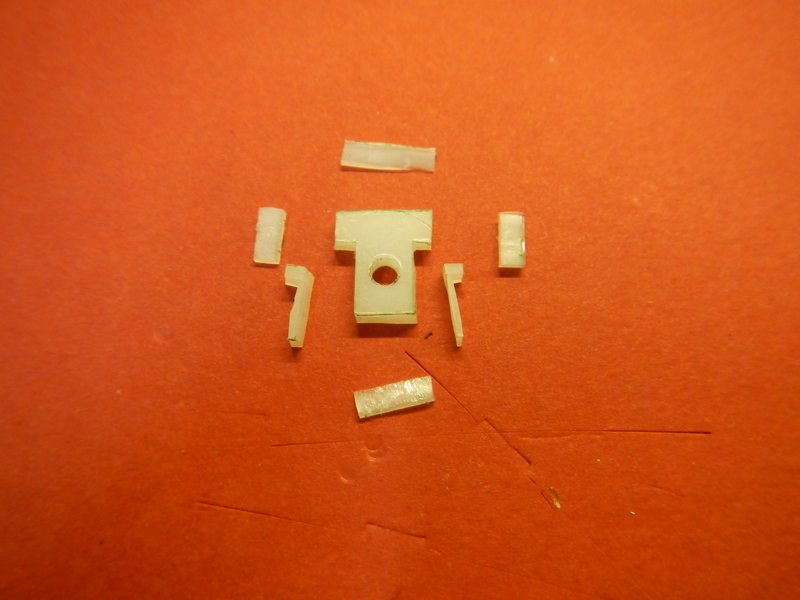 Due to the retaining wire running along the adjustment screws and the way the set posts were constructed with multiple pieces it seems that the ABR-1 had an inherent rattling problem. So much that it was audible through the pickups. Gibsons solution to this was the dampening quality of Nylon. While “official” 😉 accounts also vary in the years, it seems that the use of nylon saddles started somewhere from 1959-1961 and lasted up to at the latest 1970. With the incoming of the newer (rattle free) Nashville Tune-o-Matic, the Nylon went to the wayside. And since then the tone arguments have ensued to this date. 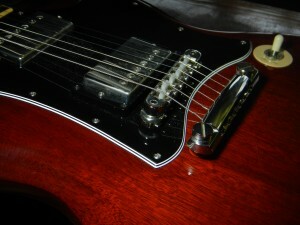 The major opinions are “tone sucking,” “tone fattening,” or “treble ping taming.” Even Joe Bonamassa uses Nylon on his unwound G B E strings to “tame” them. 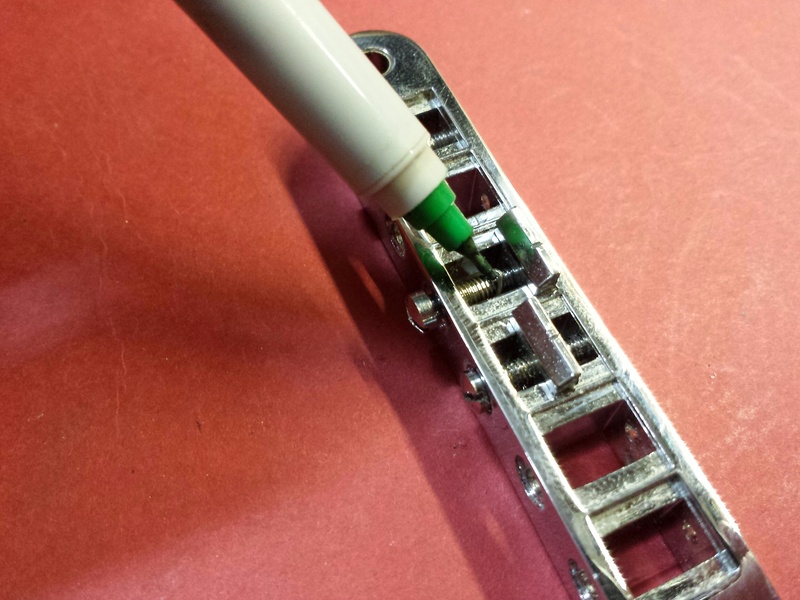 Therefor comes the reason for this D.I.Y. 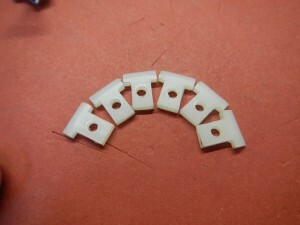 With the Nashvilles being rattle free no one has ever produced Nylon saddles for them. Which leaves those of us with Nashvilles no way to try to form our own opinion (like or hate) on their tonal qualities. I being a tone nut, like a lot of you, do not accept this so I made my own. 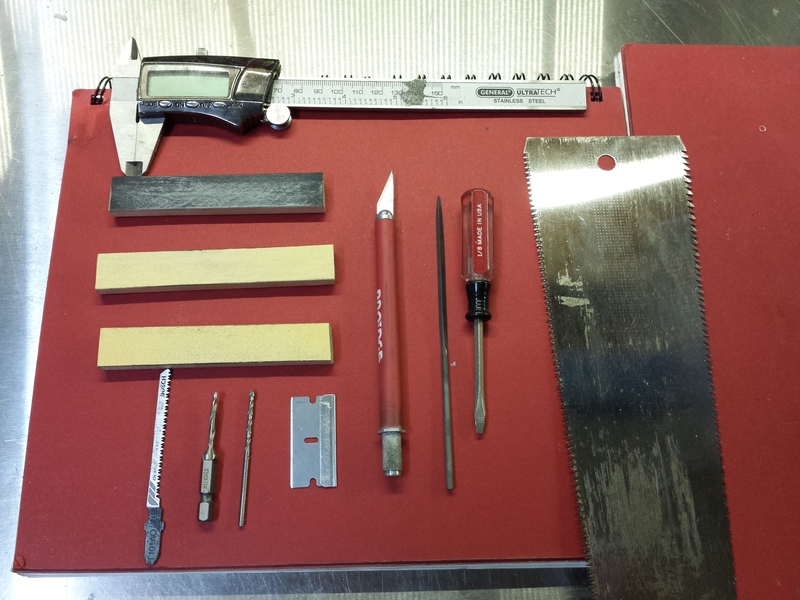 Tools needed are pictured here. As with all my D.I.Y. Posts I’m not saying anything in here is the only way to do something. It’s just my way. 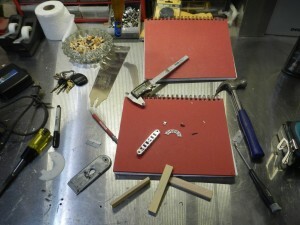 I’m trying to do these tutorials not with “proper luthier tools” but what tools most people generally have or are readily available. As seen here: you need to make sure that it is pushed out of the retaining groove so you can unscrew the saddles. 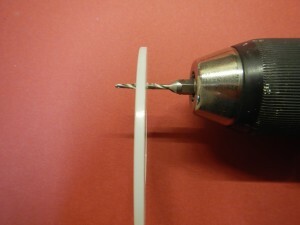 First is to pre drill the hole for the screw threads. My bridge is a Gotoh so I’m using a 2.5mm pre drill for the M3 x .5 threads. 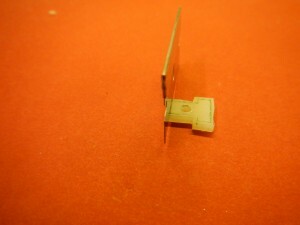 I use a drill press for this part so the hole is straight. If you don’t have one just carefully use a hand drill. 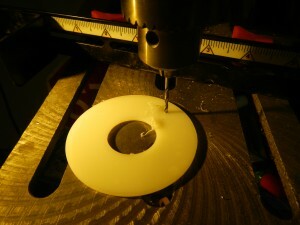 Next is to tap the threads into the hole. 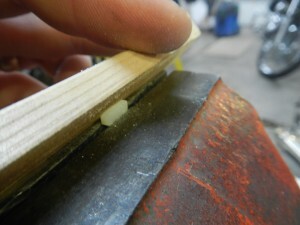 Again: If you have to use a hand drill try to hold as square as possible to the material. 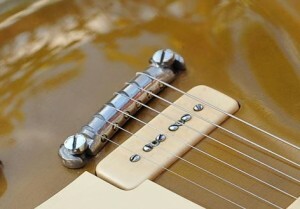 A crooked hole or thread will affect how the saddle sits in the bridge!!! 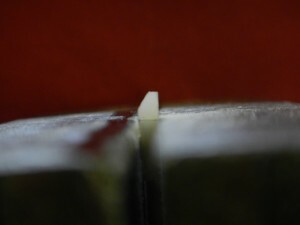 Once the threads are tapped shave off the “puckered” material with a razor blade. 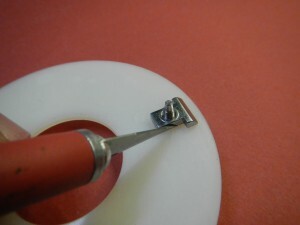 Take the saddle and screw you set aside earlier and attach it to the nylon with the intonation screw. Make sure to twist it tight so it won’t move around. Take a hobby razor knife and trace a groove around the saddle. Make sure to get all sides. O.k. 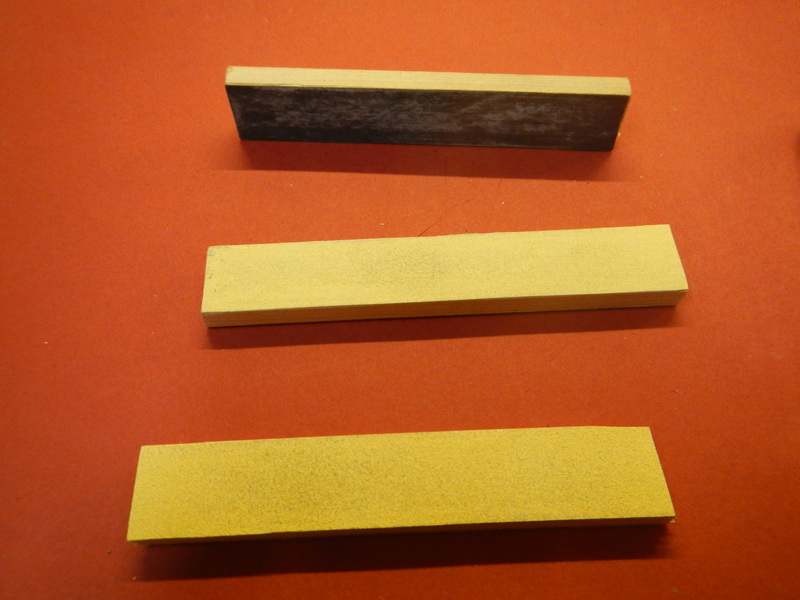 now that you’re done, here are the sanding blocks. 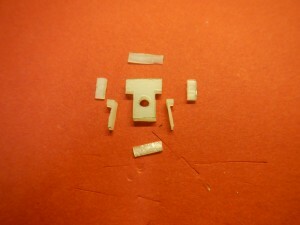 They are just pieces of fir about 1/4″ x 3/4″ x 4″ long with sticky back sandpaper stuck to them. The grits are 120, 320, and 600. Here is the fit and finish. The razor cuts will not be prefect. 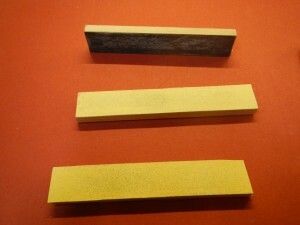 use the sandpaper to file down the cuts and shape. Start with the 120 for the heavy lifting. 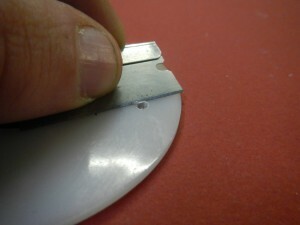 Move to the 320 to smooth out the 120 scratches, and the 600 will more polish than remove material. Make sure to check the fit in the bridge often. It should be a tight fit but not be bound up. When using the 120 and 320 make sure to STOP sanding BEFORE you reach the desired finish point so the next grit will not take it down too far!!!! DO NOT SAND THE TOP YET. THE NEXT STEP WILL EXPLAIN!!! You need to measure the saddle height from where it sits on the bridge to the top where the string will rest. 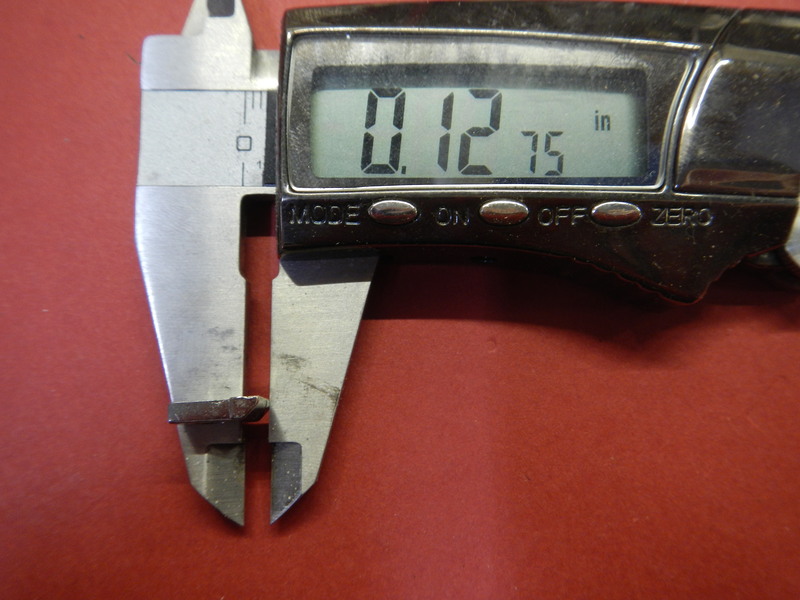 this is a critical number that has to be kept so that the strings will run correctly down the neck. Here is the adjusted Nylon. 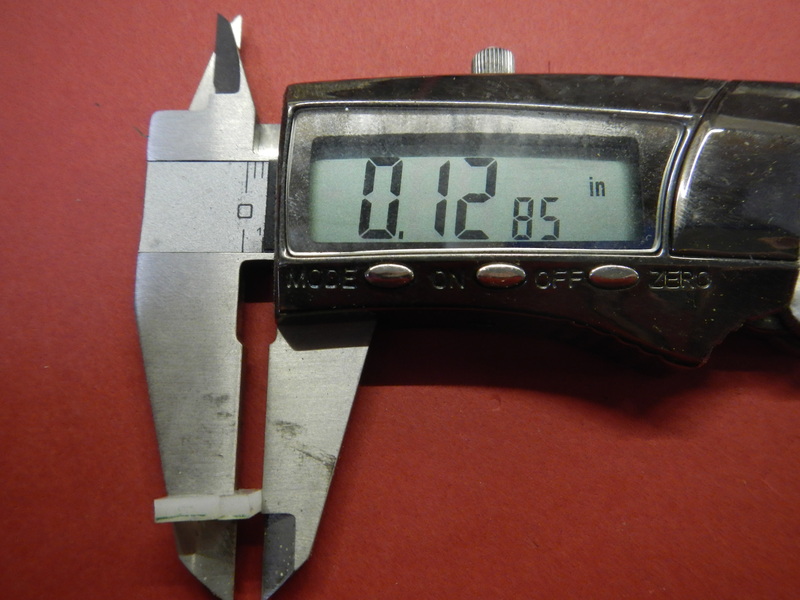 Even though this measurement is critical, to be within a few thousandths of an inch is o.k. Here is where you want to be VERY conservative with your sanding. Only use the 320 or 600 to sand here so you don’t go to far. 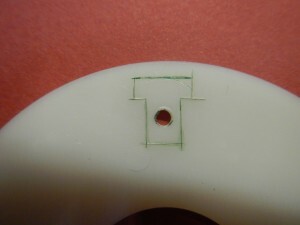 Here is where to put the “bevel” on the face of the saddle. I find the easiest way to achieve a consistent outcome is to clamp the saddle in a vise and hold the blocks at an angle and slide back and forth. Again not going to far with the 120 & 320 grits. If you don’t have a vise you can shape it by laying the block on a table holding the saddle at an angle in your fingers. Compare your new Nylon saddle to your existing one on the top so you know how much flat area to leave on top. AHHHHHhhhhhhhh….. A little patience pays off right? For reference; this took me a good half of a Saturday to complete. So if you’re home and bored????? O.k. now sit back and enjoy the mess you made. Or clean it up!!! You have more work to do!!!! Is you Guitar working yet? After you’ve aligned the strings over the poles use a razor knife to mark their position on the saddle. 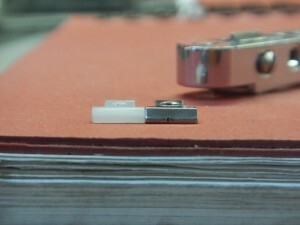 For the string slots use a very small “micro” file. Make sure not to file any deeper than half of the strings diameter. Also, as in the picture, tilt the file down (doesn’t have to be a lot) in the back so the slot will have a high point on the beveled side. 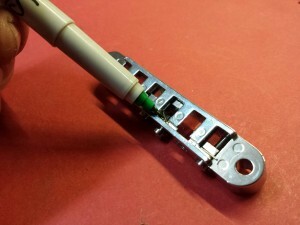 This gives a clearer contact point and will help maintain tuning better. All right!!!! Now you’re actually done!!!!! As usual any questions comments or corrections are welcome below. 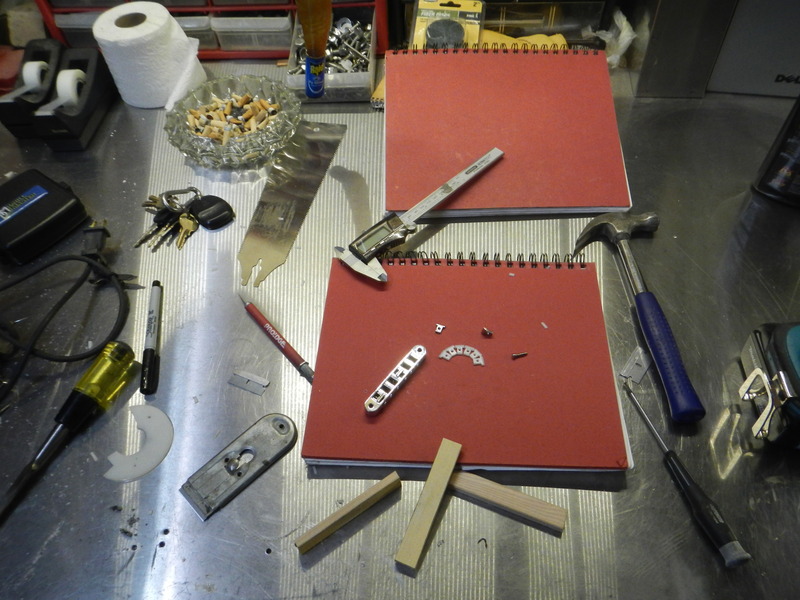 I have removed the vibrola arm to be able to use the bag without making the guitar going completely out of tune but i’d thought it could be nice to try out to change the whole vibrola for something better, can anyone suggest something that i can use without drilling the body? It feels like a jungle finding some great replacements so i’d thought asking here would do the trick. Correction! I am thinking about keeping the vibrola system(without using the arm) and just switch the bridge itself, is it safe to just do that or do i need to remove the whole vibrola + bridge and in some way install a new system? Just thinking if its gonna cause issues or anything, otherwise i switch to that one. Will also switch pickups, wiring, maybe the nut(suggestions?) and something more like maybe tuners(necessary? If so any recommendations?) but otherwise keeping it original. My guitar is a 2011 Gibson Custom Shop VOS Maestro reissue(or something, dont remember in exact detail the full name) with vibrola, faded cherry, it’s pretty stock if we discount an old angus-pickup. I would like to upgrade it and let it shine a bit more, so thats why im wondering. And I guess the possible rattling is the reason why Angus has them too on his sig SG. 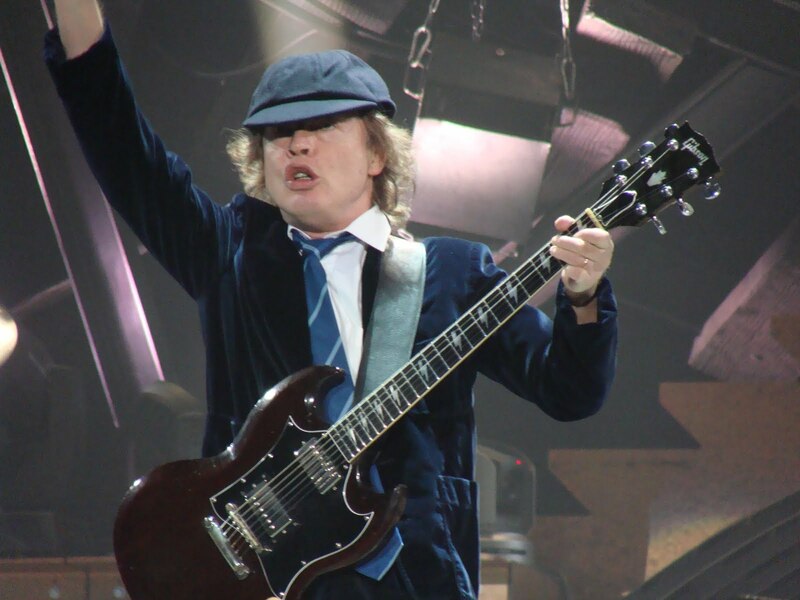 By the way, does anybody know if Angus has nylon saddles on his number 1 guitar as well? I’m still love having these on my SG. No regrets. My brother in law had me make him a set after playing mine. Angus does use them still to this day. I got them in my first Gibson Angus Young Signature Guitar. I know some off the custom models like that still come with them. Angus models like Fil’s have them to. 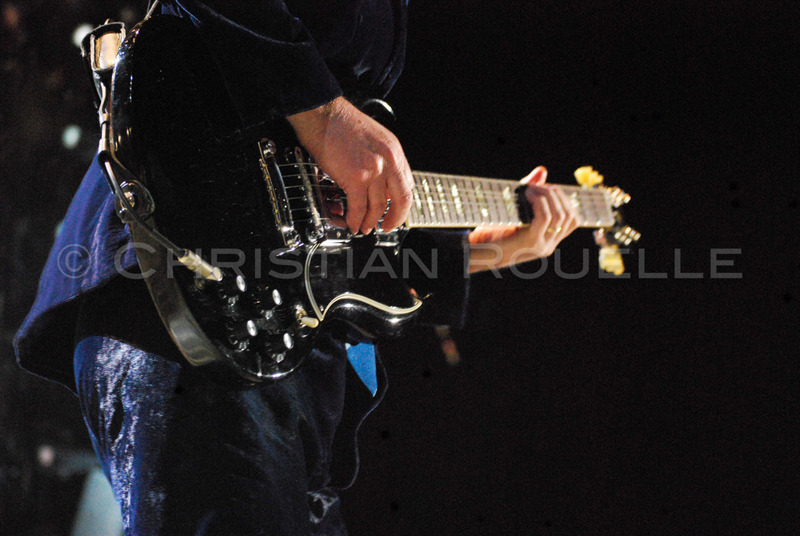 You can see in pictures of Angus’ SG that it was modeled after that they are on his.I think there’s something to be said for pro players like Angus or Joe Bonamassa wanting them on their guitars…:-) But like with everything else, to each his own ears. This is a great tutorial. I still find it odd that no one has started to make nylon saddles for the Nashvilles – I’m pretty sure I’ve seen Tusq saddles (completely different I know). Thanks again! I had the Tusq on my SG before I made these. You’re right. A whole different animal. The Tusq is really hard material. 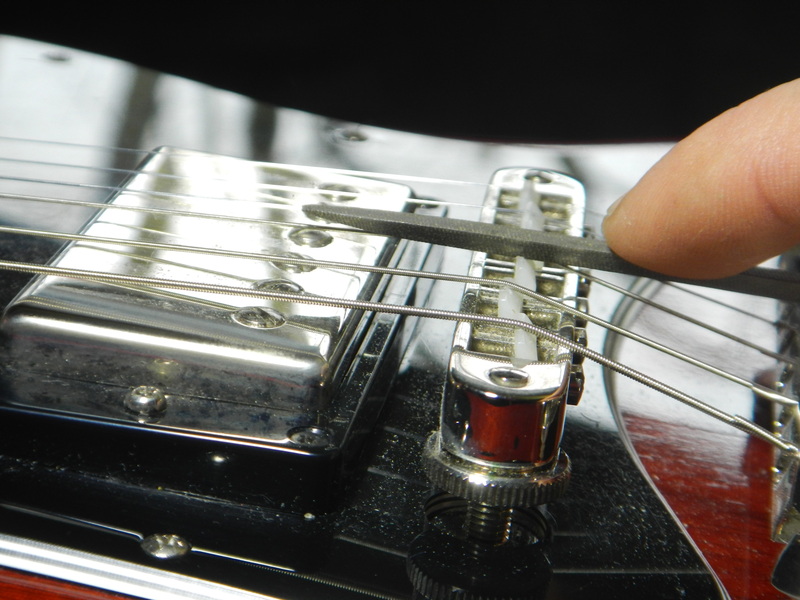 I think they are easier on the strings but tonally not much different than metal. I found out in the last couple of days that TonePros does make a whole bridge with a “G-Formula” saddle that they are calling an improvement on the original Nylon 66. 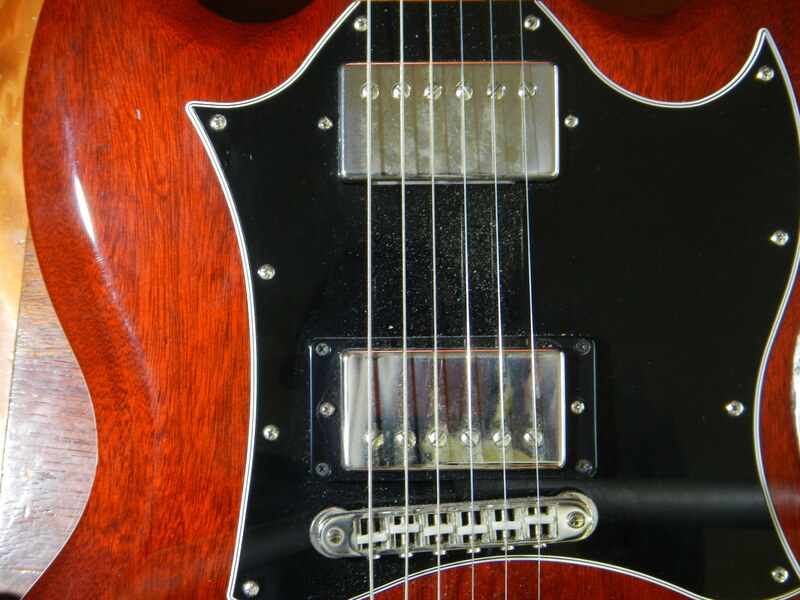 Great work My ’70 SG came original with nylon saddles, replaced them with new ones but didn’t liked it at all, don’t know, bended notes didn’t had the right sustain… Again replaced the whole bridge with a wireless ABR1, great improvement. 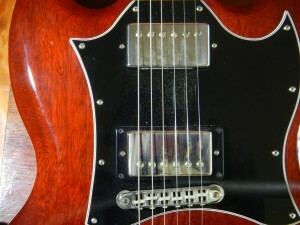 My SG, being an ’06, had the metal originals. I changed out to the Tusq ones and now these blow them away. I think they give a certain sweetness to the bending and sustain. I think it really depends on the guitar. Maybe it was due to the vibrola. A good bridge is a must too though, that changed a LOT ( those spring retainer ABR bridges are crap imo ). Nashvilles are good, but if you want the strings not to touch the back of the bridge, the stoptail must be fairly high.. That’s someting I don’t like at all !